At What Pace Should We Transition? Most organizations offering certification in frameworks tend to endorse learning ATDD after learning their frameworks. This is almost always a mistake that bogs down the adoption of Agile at the team. ATDD can be started in phases (see How to Start with ATDD using BDD). BDD and ATDD share much in common and may even be considered mostly equivalent, only differing by nuance. Both specify behavior by involving technical and non-technical people, require effective collaboration, and use either Given/When/Then or a method that is equivalent to it. BDD starts with requirements and produces the specification of a desired behavior. ATDD takes the outcome of BDD and turns it into an executable specification (a “test”). This is true whether or not the ATDD execution process is automated. Acceptance Test-Driven Development using Behavior-Driven Development helps improve clear requirements from the Business and seeing them realized across the value stream in seven interrelated ways. Clarity requires discovering ambiguities which often lie in the area of “what you don’t know what you don’t know.” While there are no guarantees even with ATDD using BDD, the interactions between the different roles and the disciplined approach that ATDD using BDD provides goes a long way towards creating clarity. While BDD does not require automation, it makes it easier by defining acceptance criteria in a form that can be easily automated. Once developers realize the time spent is on defining the tests and not automating them they are very often open to going all the way with automation. By getting developers and testers on the same page, it is usually possible for testers to begin writing tests at the same time the developers start writing their code. BDD enables virtually no delay in feedback. By discussing acceptance criteria together with requirements, misunderstandings are often found immediately. This is critical for improving flow of value and reducing delays. Requirements are an ongoing discussion. 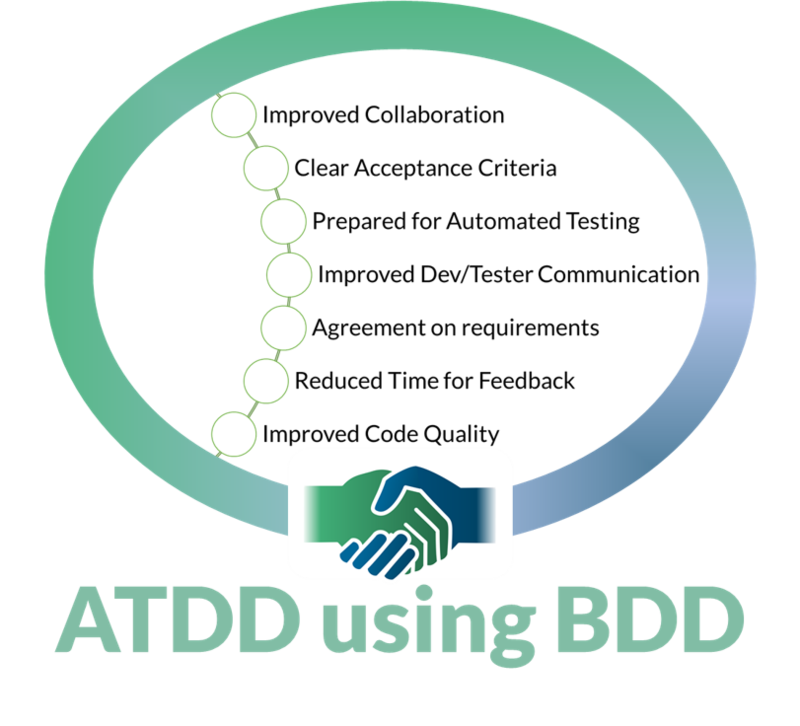 ATDD using BDD provides the framework within which to have the conversation. Instead of a set document, the agreement is to discover what’s needed throughout the lifespan of the product. One of the most important design skills is “consider your tests before writing your code.” This consistent with the first mantra of Design Patterns : “Design to the behavior of your classes before considering how to implement them.” To learn more about this type of thinking, see the chapter Design Tests Up- Front in the online book, Essential Skills for the Agile Developer: A Guide to Better Programming and Design.